World champion Viswanathan Anand played out a draw with English Grandmaster Michael Adams to be joint second after the sixth round of Grenke Chess Classic now underway here. 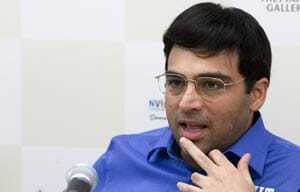 With his fifth draw out of six games, Anand took his tally to 3.5 points out of a possible six and was joined by German Grandmaster Arkadij Naiditsch in the second spot after the latter came up with a sterling effort to beat compatriot Daniel Fridman. The other game of category-19 tournament between Fabiano Caruana of Italy and Georg Meier of Germany ended in a draw leaving the former still in front with just four rounds to come. Caruana on four points enjoys a slender half point lead over Naiditsch and Anand while Fridman and Adams share the fourth spot on 2.5 points apiece. Not far behind is Meier, who has two points. Anand played his third white in the tournament but could not make much impression on Adams who felt the heat but was never in any serious problems. For the records, it was a closed Ruy Lopez in which Adams was saddled with a passive knight on the queen side. However it was not much as Anand himself noted in the post game chat, "black can live with this weakness until the queenside opens up," he said. According to the world champion, his 22nd move was not the best when he developed his queen. "Usually when you make sophisticated moves like this it usually means that you have lost track somewhere", Anand said. As it happened in the game, Adams equalised without much ado thereafter and subsequent exchanges led to a rook and pawns endgame with no chances for either side. The draw was agreed to on move 41. Naiditsch played a stunning game to beat Fridman. The German has been involved in as many as five decisive games out of a total six in the tournament and he continued with his do-or-die approach even as black against Fridman. The King's Indian defense met with the Classical set up and Naiditsch threw the position open with a fantastic knight sacrifice in the middle game. The move left everyone present shocked as black slowly developed an attack against a weak white king. According to the machines, the position was defendable but it was out of the wits of a human mind to sustain such pressure. This was certainly the game of the tournament thus far. Luck continued to be on the side of Caruana as he survived another mishap. Meier had a winning position on board and was just one correct move away to score his first victory but the German erred decisively to reach a drawn queen and pawns endgame.